The Commercial Pilot Program is designed to produce top notch aviation professionals. This program helps students be future-ready for a career in aviation.The holder of a commercial pilot license has unlimited access to flying opportunities and industry-standard emoluments to boot. To realize his/her dream of flying ,a student will have to meet the criteria set by the respected CIVIL AVIATION AUTHORITY, as license requirements vary with each country. Ø Please note the students have to bear the flight ticket/Stay charges (to and fro manila),for Additional Ratings, CPL/IR Examination and AIRMAN MEDICALS in CAAP, MANILA and CAAP CHECK RIDE FEES. For Set of Application Form Send a Demand Draft of Rs.10,000/- to AirCrews Aviation Pvt Ltd Indore 452 005 India. Foreign Students [ Non Indians ] make an International Demand Draft of US$ 250. 1. Read this Student's Course Information Manual and other associated documentation carefully. If you have any question, ask the to AirCrews Aviation Pvt Ltd International Aviation Academy’s admission officer or the local office. 2. When you are satisfied and have decided to enroll, fill out the to AirCrews Aviation Pvt Ltd International Aviation Academy Overseas Student Enrollment Form, with as many detail as possible. Send this forms and form and then send the original with a Demand Draft of Rs.10,000/- to AirCrews Aviation Pvt Ltd Indore 452 005 India. Foreign Students [ Non Indians ] make an International Demand Draft of US$ 250. 3 .Deliver the completed Overseas Student Application Form for enrolment to AirCrews Aviation Pvt Ltd or their local Office. If we do not have a local Office in your country, send it directly to AirCrews Aviation Pvt Ltd Indore 452 005 India. 4 .AirCrews Aviation Pvt Ltd International Aviation Academy will acknowledge your application promptly and will immediately indicate if your application is accepted. Also we shall send you a call letter for Admission Test & Interview. 5.Once you have been accepted, to AirCrews Aviation Pvt Ltd will send you a Confirmation of Enrolment form based on the Course indicated and starting date indicated. 6. AirCrews Aviation Pvt Ltd will complete the contract of Enrolment for the course for you to sign and send back. 7. Once you have finished pre flight training, AirCrews Aviation Pvt Ltd or your local Office will then assist you with the formalities required to obtain your visa and make arrangements for you to start the Course. If there is not a local Office in your country, you must attend the Australian / USA / Sri Lanka Embassy / Consulate to make arrangements for your visa. AirCrews Aviation Pvt Ltd do not take any guarantee for VISA. VISA is subject to all documents. 8. Please pay all fees by DD or local cheques only. AirCrews Aviation Pvt Ltd will not accept cash. For the set of Enrolment form & Brochure please send a D. D. Or M. O. of Rs. 10,000/- in favour of “AirCrews Aviation Pvt Ltd." INDORE "to the following address. She has to Maintain the Work structure by updating job Requirements and Job Descriptions for all Positions. Maintains organization staff by establishing a Recruiting, testing, and interviewing program; Counseling Managers on Candidate selection. Aviation P Ltd [ www.AirCrewsAviation.com ] is a Newly Incorporated Aviation Service Providers of India. 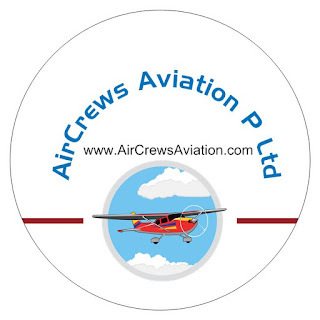 AirCrews Aviation P Ltd [ www.AirCrewsAviation.com ] is duly registerd with Govt Of India, Ministery of Corporate Affairs to run various Aviation related Services. 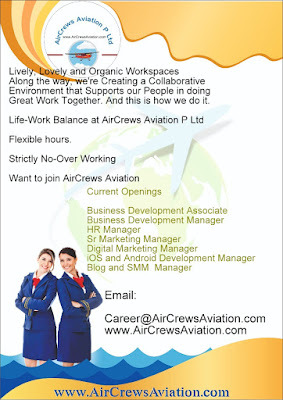 AirCrews Aviation P Ltd [ www.AirCrewsAviation.com ] is Incorporated to boost and aggregate various Aviation Service Providers. We welcome All Aviation Organisation to Join us as our Partner in Progress in Aviation. We are looking for Ab-initio Pilot Training, TRTO, Air Charters and Air Crew HR Organisations from all over the world.